I hope your 2013 was memorable and full of good times with family and friends. 2013 was good to us, we have no complaints! I thought I would do a quick round up of the most popular posts I created on Gluesticks this year. I had a great time creating this year and these are based on the popularity and page views from my readers. You guys are amazing. Thank you for visiting and taking the time to comment too! As we approach 2014, I am curious to know what you’d like to see more of on Gluesticks. I don’t generally create projects to blog about. I blog about projects that I am doing on my own, and would do even if I didn’t have a blog. That being said, I don’t mind taking requests or suggestions! Just follow the links to the easy to pin projects! 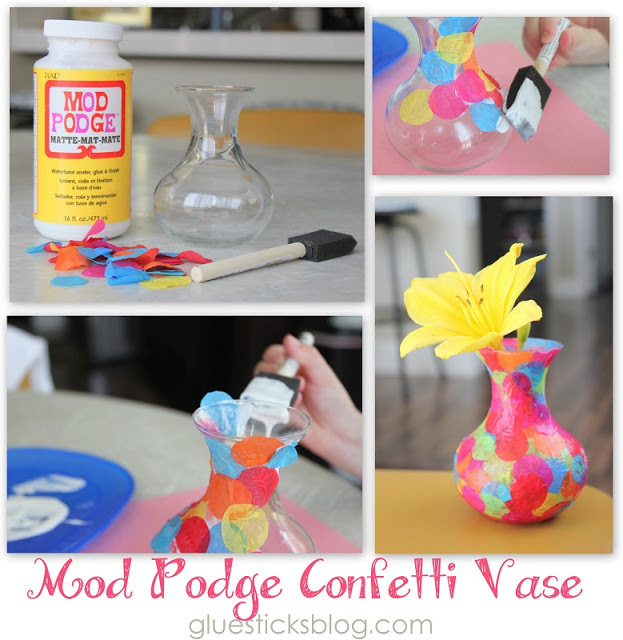 This quick and easy confetti vase is just made with tissue paper and mod podge. Customize it using any color scheme! It is a great project to make with kids. These little vases would make great inexpensive Mother’s day gifts to make with groups. You can find little vases like these at the dollar store. 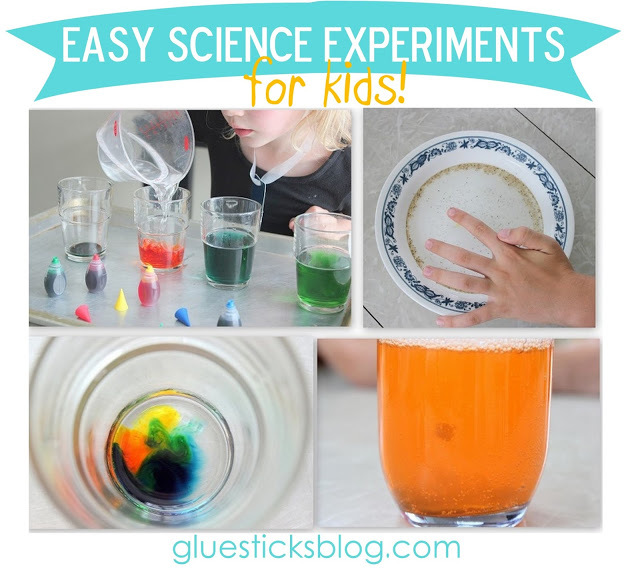 What kid doesn’t love watching the reactions of simple science experiments? Here are our favorites! As fast as kids grow out of pajamas, it’s nice to have a quick and easy method for replenishing their drawers. Stock up on flannel when it goes on sale at Joann’s and you’ll be set all year! No pattern necessary to make these comfy pajamas! Use your favorite essential oil to scent this homemade chapstick made from coconut oil and beeswax. You can play around with the consistency to make it as rich or firm as you’d like! Come follow along as I show you how I tackled my first upholstery project, which just so happened to be a huge one! I finished it and you can too! I shared some simple tips to make your first project a success too. Take advantage of the talent from other bloggers who created these amazing FREE printables! I compiled my favorites into a day planner to use in 2014. With these easy click-through links, you can too! Making fried chicken can be intimidating. Nobody wants raw chicken with a burnt crunchy skin. That’s what I used to get when I made homemade fried chicken. You’ll never guess the two secret ingredient that make this recipe a true keeper. Use chicken pieces to make a bucket of chicken for your family, or chicken tenders for the perfect chicken strips for your kids! After baking batch after batch of dense, dry banana bread, I came up with a method that rivals our favorite bakery’s banana bread. So easy and perfect. I make this all the time to slice up for a go-to breakfast for the kids. A collection of my favorite homemade cleaning products. From a never fail stain remover for baby’s spit up messes and blow outs, to a homemade laundry detergent that can’t be beat! I’m a busy mother of 4. I don’t have time to deep clean my house every week and I have a feeling you don’t either. Here is how I keep my house tidy without missing out on fun times with my kids! Be sure to get them involved in the process to make it go even quicker. My favorite sugar cookie recipe. Use cake flour and butter to create a light and melt in your mouth cookie. After wasting too much money over the years on flimsy princess dresses that fell apart, I created these play aprons for my girls. They are made from study cotton and hold up well with many washes. Velcro closures make them easy on and off for children who don’t know how to tie aprons on. Use my pattern/tutorial to create 6 variations! Don’t see a princess that you’d like? That’s ok! It’s easy to customize my pattern to create any princess you’d like. If you need suggestions on how to do so, just shoot me an e-mail! One of my favorite projects this year ended up being yours too! Our homemade poppy seed soaps that I made for Mother’s Day gifts were the most popular post created on Gluesticks in 2013! I take the easy road with soap making. It is more of “soap melting”. Use melt and pour soap bases to customize in a million different variations of scents and textures to create one of a kind gifts. It’s so fun and easy to do!